ASUS Republic of Gamers and MET Join Forces for the Official PUBG Southeast Asia Championship. Winners will get a chance to represents the region at the PUBG Global Invitation in Berlin. 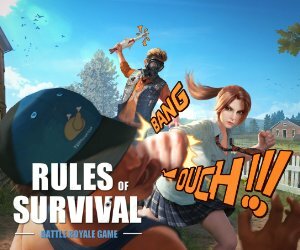 PlayerUnknown’s Battlegrounds or PUBG, the 100 players online multiplayer battle royale game developed by the PUBG Corporation (Bluehole) is now entering the esports scene and gives a chance for our aspiring Southeast Asian PUBG players. MET is searching for the best squad players as they announce the PUBG Southeast Asia Championship presented by ROG. The PUBG Corporation officially supports this competition and the winner for this competition will get a spot on the PUBG Global Invitation (PGI 2018), that will be happen in Berlin on July 2018. ASUS Republic of Gamers (ROG), the world’s #1 gaming brand, is choosing the game PUBG as their newest ground for eSports competitive gaming. Recently, they held the ROG Masters 2017 in the Philippines with the popular game Dota 2 and Counter-Strike Go. With its full squad of professional gaming products from motherboard, graphics card, monitors, gaming laptop, routers and other peripherals. ASUS ROG is set to deliver the best gaming experience this year on the SEA. THE PUBG Southeast Asia Championship is MET’s latest regional tournament, a true testament to MET’s claim as the top esports organizer in Asia. MET continuously delivers optimal esports tournaments for both aspiring and professional gamers across entire Asia. The PUBG tournament will happen concurrently across five venues with six nationalities on the SEA regional final. The grand PUBG tournament will seek the best squads across these six different countries (Philippines, Indonesia, Malaysia/Singapore, Thailand and Vietnam) in five different qualifiers before advancing to the national qualifiers of each country stated. The winners for each national qualifier will advance to the SEA Finals that will happen in Thailand this coming June 23-24, 2018 and will be crowned as the best SEA squad. Both the Thai National Champions and overall Regional Champions will be moving to the PUBG Global Invitational in Berlin in July 2018. THE PUBG Southeast Asia Championship Qualifiers will officially kick off on April 28, 2018 and is open to all squad players over the region that will accept the challenge as becoming the SEA’s top PUBG Squad. How to Join the ROG’s Southeast Asia Championship? Registration and other details are to be announced. For more information and updates, you can visit official Facebook page of ASUS ROG, PUBG Philippines and MET Events. ASUS Republic of Gamers and MET Join Forces for the Official PUBG Southeast Asia Championship. Winners will get a chance to represents the region at the PUBG Global Invitation in Berlin. PlayerUnknown's Battlegrounds or PUBG, the 100 players online multiplayer battle royale game developed by the PUBG Corporation (Bluehole) is now entering the esports scene and gives a chance for our aspiring Southeast Asian PUBG players. MET is searching for the best squad players as they announce the PUBG Southeast Asia Championship presented by ROG. The PUBG Corporation officially supports this competition and the winner for this competition will get a spot on the PUBG Global Invitation (PGI 2018), that will be happen in Berlin on July 2018. ASUS Republic of Gamers (ROG), the world's #1 gaming brand, is choosing the game PUBG as their newest ground for eSports competitive gaming. Recently, they held the ROG Masters 2017 in the Philippines with the popular game Dota 2 and Counter-Strike Go. With its full squad of professional gaming products from motherboard, graphics card, monitors, gaming laptop, routers and other peripherals. ASUS ROG is set to deliver the best gaming experience this year on the SEA. THE PUBG Southeast Asia Championship is MET's latest regional tournament, a true testament to MET's claim as the top esports organizer in Asia. MET continuously delivers optimal esports tournaments for both aspiring and professional gamers across entire Asia. The PUBG tournament will happen concurrently across five venues with six nationalities on the SEA regional final. The grand PUBG tournament will seek the best squads across these six different countries (Philippines, Indonesia, Malaysia/Singapore, Thailand and Vietnam) in five different qualifiers before advancing to the national qualifiers of each country stated. The winners for each national qualifier will advance to the SEA Finals that will happen in Thailand this coming June 23-24, 2018 and will be crowned as the best SEA squad. The ROG's PUBG Southeast Asia Championship Schedule National Qualifiers Philippines (May 5 to June 3, 2018) Indonesia (April 28 to May 13, 2018) Malaysia/Singapore (May 5 to May 27, 2018) Thailand (May 7 to June 10, 2018) Vietnam (May 12 to June 13, 2018) National Finals Philippines (June 9 to 10, 2018) Indonesia (May 19 to 20, 2018) Malaysia/Singapore (To Be Announced) Thailand (June 22, 2018) Vietnam (June 16, 2018) Regional Finals Thailand (June 23 to 24, 2018) Both the Thai National Champions and overall Regional Champions will be moving to the PUBG Global Invitational in Berlin in July 2018. THE PUBG Southeast Asia Championship Qualifiers will officially kick off on April 28, 2018 and is open to all squad players over the region that will accept the challenge as becoming the SEA's top PUBG Squad. How to Join the ROG's Southeast Asia Championship? Registration and other details are to be announced. For more information and updates, you can visit official Facebook page of ASUS ROG, PUBG Philippines and MET Events.